I’ve been enjoying my knitting so much over the last couple of weeks that it’s been REALLY hard to get back into uni study! I’m proud of myself though since I haven’t started a new project for a while, opting to instead work on WIPs already on the needles. Despite having some really lovely yarn all balled up and ready to work with, I’ve been a very good girl and haven’t touched it. Yet. Of course the whole ‘no new projects’ thing will change in the next week or so when I get my yarn delivery from the UK. I’ve bought some Stylecraft DK to do the Persian Tiles crochet blanket pattern by Janie Crow. All of you lovely knitters/crocheters living in Australia will know that our local supply of acrylic yarns is severely lacking, so I’ve bought this stylecraft to see whether it’s any better than the crappy Spotlight acrylic we can get here. Seriously though, that’s not a big ask. My latest WIP progress has been on my rainbow wrap! I put it down at the halfway point because I was a little depressed about the amount of work I’d already put into it, only to be half done! After completing the cedar leaf shawl and my sock (yeah, I haven’t done the second sock to that either, I have some serious second sock syndrome going on) I felt a bit better about continuing on, and I’m very glad I did. I’m really enjoying working with that yarn again. 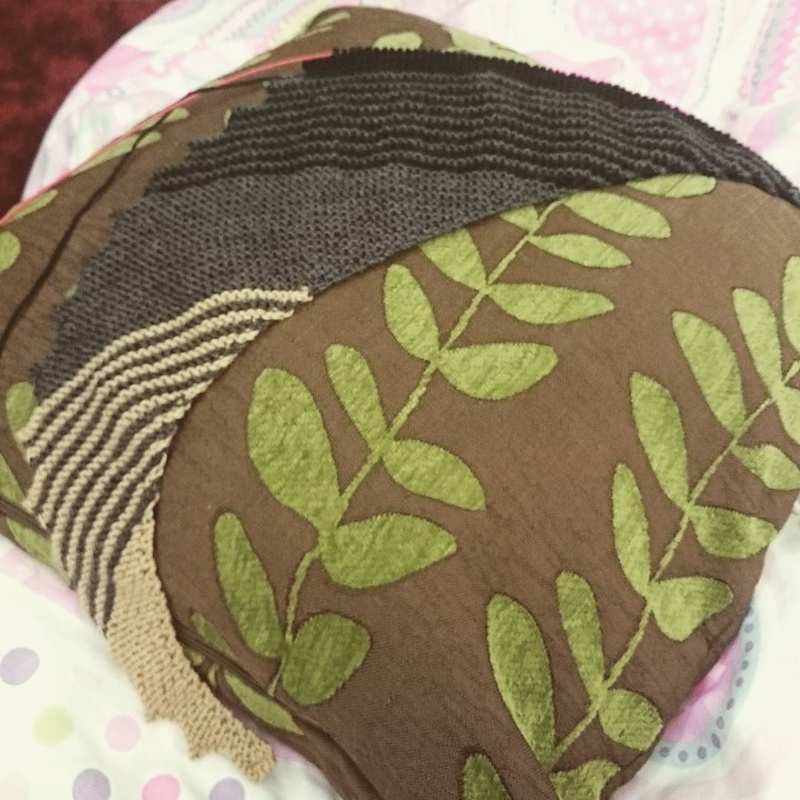 I’ve just told my workmate/friend/boss that I’d make her a cedar leaf shawl, so I guess that project will fit in somewhere between the rainbow wrap and the persian tiles blanket. I already have the yarn for that – a lovely golden autumn shade of Cascade 220 Heather. Yummy. I’m wearing mine today for the very first time, and I’m so in love with its colour and drape. Lorna’s Laces yarn might be pricey but Oh. Em. Gee. So lovely. I’m on fire! The beach shawl is finally finished, after a big push over the last couple of days to get it done (so I can move on to a NEW PROJECT! shhh). I’m really happy with it; I love how the colour has worked out. I’ll block it over the weekend and hopefully will stretch it to a larger size – at the moment it’s large enough to drape over my shoulders but I’d need a pin to keep it around me. I’ve now started the Cedar Leaf Shawlette, which looks absolutely gorgeous and seems to be a rather quick knit. I got a call from my local yarn store yesterday to tell me that my second skein of Lorna’s Laces Shepard Worsted Multi in the Baltic Sea colourway has arrived and is awaiting my purchase, so that is what I’m using for this shawlette. It’s an amazing forest colour – greens and browns reminiscent of a forest floor. Perfect for this leafy shawl! It’s beautiful to knit with too, silky and smooth and it glides across the needles like a dream. This was supposed to be another Christmas holidays project, but I ended up spending too much time sleeping and fishing and obviously not enough time knitting! I’m using the Marin Pattern by Ysolda, and knitting it in Magic Light from Ice Yarns with 4.5mm needles. I originally started this project in lovely Lorna’s Laces Shepard Worsted Multi, but I found the pattern a little confusing to start with and I had to frog a few times. I then decided that I would learn the pattern using acrylic so I could then make another in the better yarn. In saying that though, I’m really enjoying knitting in the magic light, and the colours are striping nicely. If I push hard over the next week I should get this finished – I’m already planning my next project in Madeleine Tosh Merino Light that I may or may not have purchased yesterday…. Let me first get this over and done with – Happy Christmas and New Years and all that jazz! I’m having a wonderful time at the moment doing whatever I please, since I’m in the middle of my almost three weeks off. My day usually starts with a lovely sleep in, followed by some computer games and then knitting or crochet (or both) in the afternoon. The housework is piling up, and my garden has become a jungle. My gym access card also hasn’t seen much use in the last few weeks, but screw it I’m on holidays! I reorganised my stash one afternoon last week, and decided that I had way too much crappy acrylic yarn and needed to make a stash buster project. I chose to make a mandala rug, using 5 strands at once and a 8mm hook, using any yarn I could get my hands on (acrylic, wool and cotton mainly). The pattern is John Kelly’s Mandala 21, which is easy to find on Ravelry. 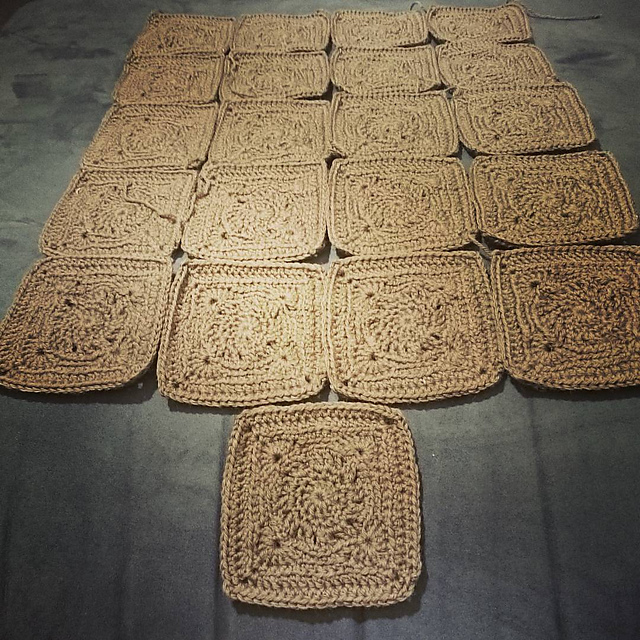 The pattern itself was well written and the only painful row was the backpost double crochets and front post triple trebles….yeah you try working those in five strands at once and if your hands don’t feel like overheated iron weights afterwards, you must be superman! This took me two full days (I watched all six star wars movies plus a season of a tv show all while I was working on this) but it WAS worth it. If I make another of these, it won’t be for a while in order to let my poor hands recover. I don’t have time for much of a post today, but thought I would share some images of my finished project – the Fallout Wrap! I finished it on Saturday, and I’m in love with it. It didn’t need blocking so after binding off and weaving the last few ends in, it was ready to wear! I’m now happily knitting away on a new shawl pattern which I will show you in the next couple of days, using a lovely colourway in Crazy Zauberball 100 yarn. I Dub Thee: Fallout Wrap! The socks that I’ve been knitting have gotten me interested in other knitted projects, so I decided (after many advice filled conversations with an old school friend who is extremely competent in the knitting department) that I’d start a nice easy project to ease me into the world of knitting. The pattern I’m using is called the ‘Hitchiker’ which can be found on Ravelry here. I’m using 4ply merino wool in three earthy tones, on a 3.75mm circular needle (first time using a circular needle….WHY HAVE I NOT USED THESE BEFORE?!) and I’m really enjoying the project so far. As you can see in the image below I’m about halfway through the pattern already, all of that lovely garter stitch is really fast to knit up. I love the texture of it – it’s relaxed and stretchy yet still dense and will keep my neck warm next winter! 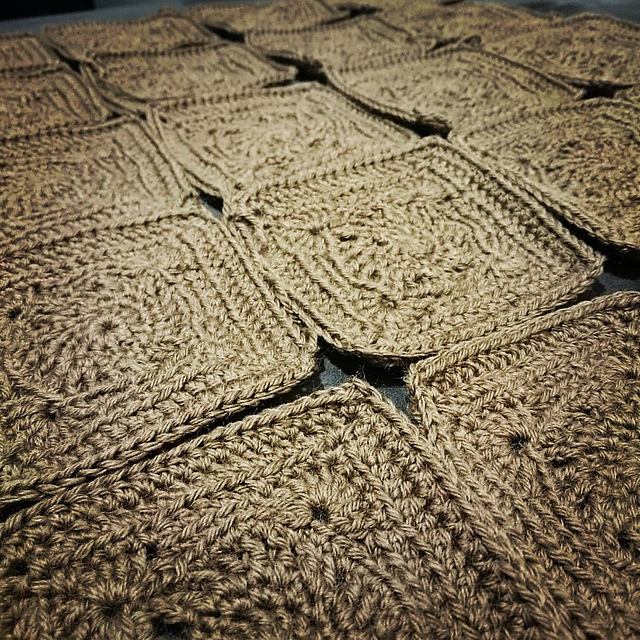 Initially I was just calling this project the ‘Hitchiker Wrap’, but I’ve been knitting it while watching my favourite fantasy author Patrick Rothfuss’ Twitch channel as he livestreams his adventures in the recently released Fallout 4 game. My favourite author, my favourite game and a great project to work on….what more could you want? So I’ve decided to called this wrap my ‘Fallout Wrap’. I think it’s rather fitting with it’s earthy apocalyptic tones, and would be quite handy if you needed to fight some ghouls in cold weather, just saying.